The Next Big Thing… The Easton Stealth S19 Z-SHOCK helmet. Easton is gearing up to revolutionize the helmet market just as they did the stick market with the introduction of a one-piece composite stick back in 1999. The Stealth S19 Z-SHOCK is a one-piece composite helmet. That’s right! The S19 laminates EPP foam and the plastic polycarbonate shell as one unit. This construction delivers new higher levels of protection at nearly HALF the weight of current hockey helmets. The increase in protection and reduction in weight is achieved from the one-piece design which allows Easton to replace air gaps created by layers of plastic found in traditional two-piece helmets with protective EPP foam. And since the components of the S19 helmet are laminated together acting as one solid, stiffer state, this design allows the helmet to absorb impacts better increasing the level of protection beyond two-piece helmets. Since the S19 helmet is a one-piece design a performance fit is achieved through 5 different shell sizes, oversized comfort pads and a micro adjustable back strap. The S19 helmet definitely passes the mirror test with a 5-10% reduction in the overall outer dimensions when compared to other popular high-end helmets on the market today. It delivers that sought after slim, non-bubble head look that has made Bauer 4000 and CCM 652 styled helmets so popular for years yet in a more protective and lighter helmet. That’s why NHL players are referring to it as the Next Big Thing. And I would have to agree. Easton is planning on showcasing S19 in the upcoming 2010 Olympics and delivering it to InlineWarehouse.com and IceWarehouse.com in mid-May. The first delivery will consist of black, white, navy, royal and red color ways, with 9 more colors to be released in July. The helmet will only be available in a helmet only version and the MSRP will be $169.99. 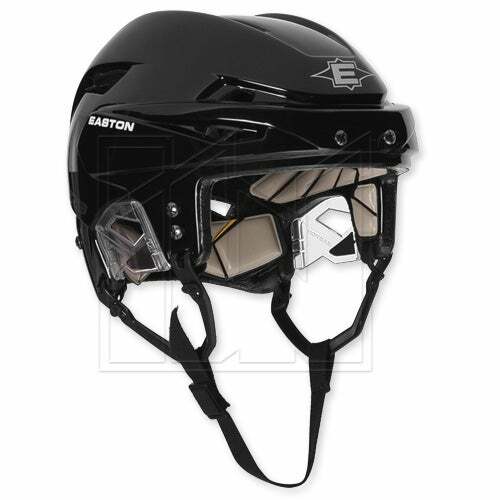 This entry was posted in Other Hockey Gear Reviews and tagged Easton S19 helmet, Easton S19 helmet review, Easton Stealth S19 Z-Shock Helmet, Hockey helmet product review, IceWarehouse.com, New Easton helmet, S19 hockey helmet, Z-shock helmet on March 19, 2010 by Cory.